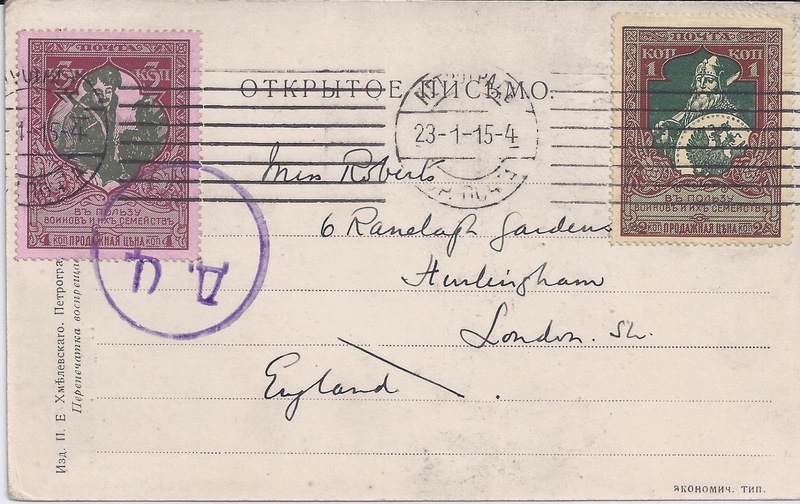 There are collectors who try to find every issued stamp from their chosen country and period used on a cover. Some make it a more difficult task by ruling out philatelic usages or usages at the wrong date. Some set themselves the even harder challenge of accepting only single frankings. Imperial Russia did not really issue many stamps and it ought to be possible to find them all used on cover or card or Money Transfer Form or Parcel Card ... but some are very, very elusive. The card above shows one very elusive stamp neatly used at the correct period on a card franked at the correct tariff (4 kopecks). It may be that the sender - an Englishman staying at the Grand Hotel Petrograd - chose the stamps to make the card look more interesting but he probably did not realise that the 3 kopeck stamp on the left is the scarce one with perforation 13.5. This stamp is hard to find mint or used and people seem willing to pay 100 to 150 euros for examples (see the last www.filateliapalvelu.com auction results for Russia). This is the first time I have seen the stamp used on a cover or card and I hope to get a very good price for this very nice example of its use!